U.S. Meteorologist Robert L. Smith checks over one of the radar operated weather tracking pieces of equipment in the U.S. Weather Bureau located in this northwest Florida coastal city [Apalachicola, FL]. This station is one of five that fringe the state. The equipment Mr. Smith is looking at is a radar operated camera that takes both still and movies of heavy weather disturbances up to 150 miles away. The picture at the right was made several years ago and shows a hurricane off the southeastern Atlantic coast. 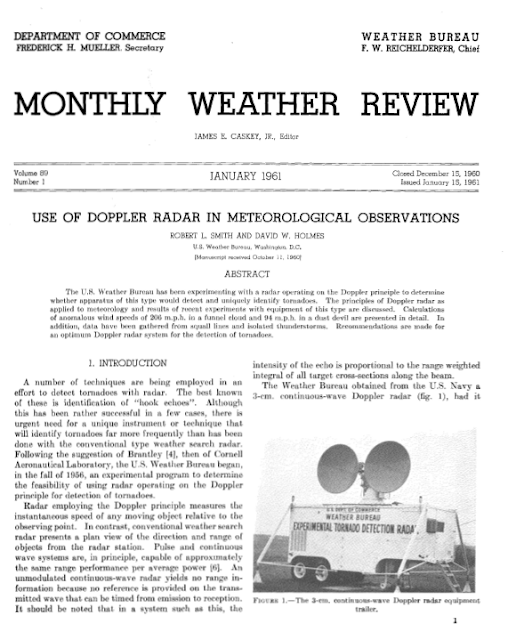 The first Doppler-radar measurements of a tornado were made in 1958 by U.S. Weather Bureau meteorologists R. Smith and D. Holmes. They obtained a Doppler radar from the U.S. Navy, set it up in Wichita, Kansas, and then waited. Just over a year later, on June 10, the radar detected a tornado in El Dorado twenty-five miles away. What luck that a tornado happened to touch down within range of the first Doppler radar used for meteorological purposes! The likelihood of a tornado striking within thirty miles of a given location during a given spring is extremely small. 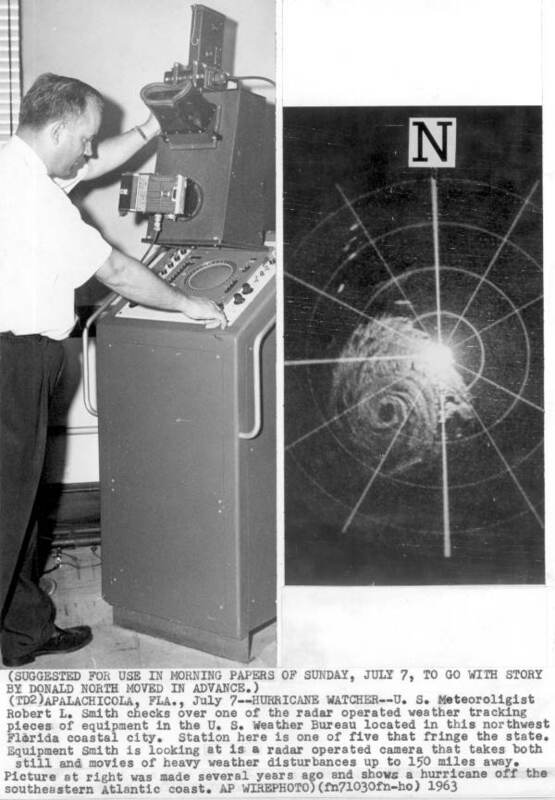 Although at the time it was not possible to discriminate between approaching and receding velocities, the wind spectra obtained by this radar detected maximum velocities (that is, wind speeds in the line-of-sight direction) of 200 mph. Click to go to the PDF file of the entire study.